Today is the anniversary of the death of Maximilian Schaefer, whose exact birth date is not known (1819-March 23, 1904). He was born in Wetzlar, which is part of Hesse, in what today is Germany. He arrived in New York in 1839, a year after his brother Frederick came to America, and the two co-founded F&M Schaefer Brewing Co. in 1842. It was Max who brought with him a recipe for what would become their lager beer. Beer Magnate. In 1839 he emigrated to the United States, carrying with him the recipe for lager, a popular brew in Germany that was then unknown in America. 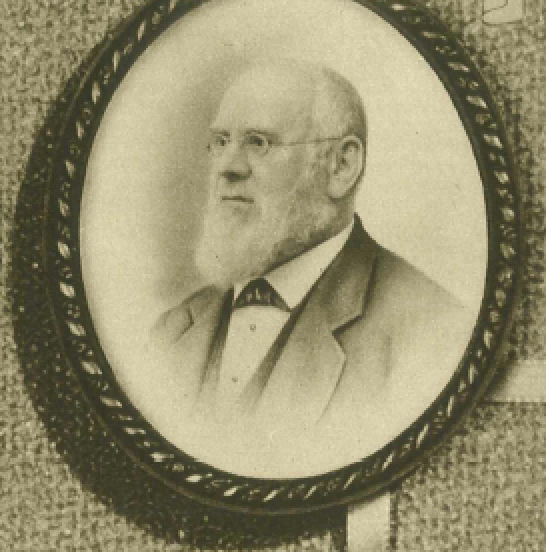 He joined his brother Frederick in the employ of a local brewer, and in 1842 the Schaefer brothers bought out the owner, establishing F & M Schaefer Brewing. 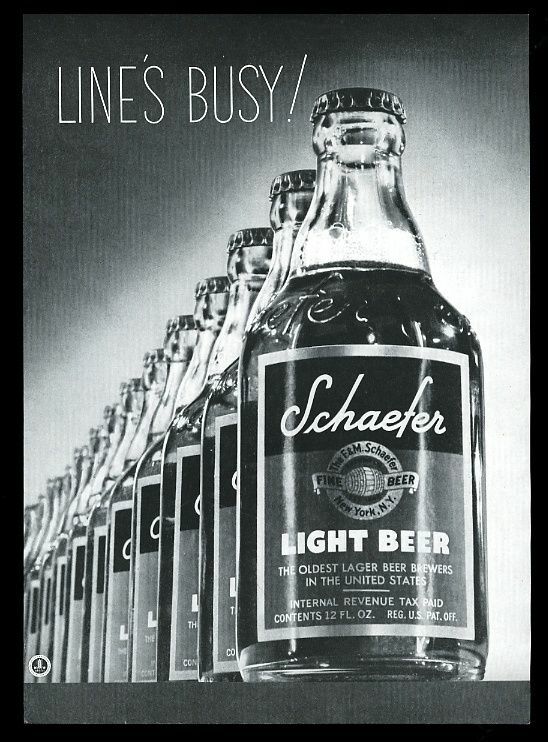 Lager proved popular and the Schaefer company became one of the country’s largest beer producers, with Maximilian Schaefer remaining active in the company until failing health caused him to retire in the late 1890s. 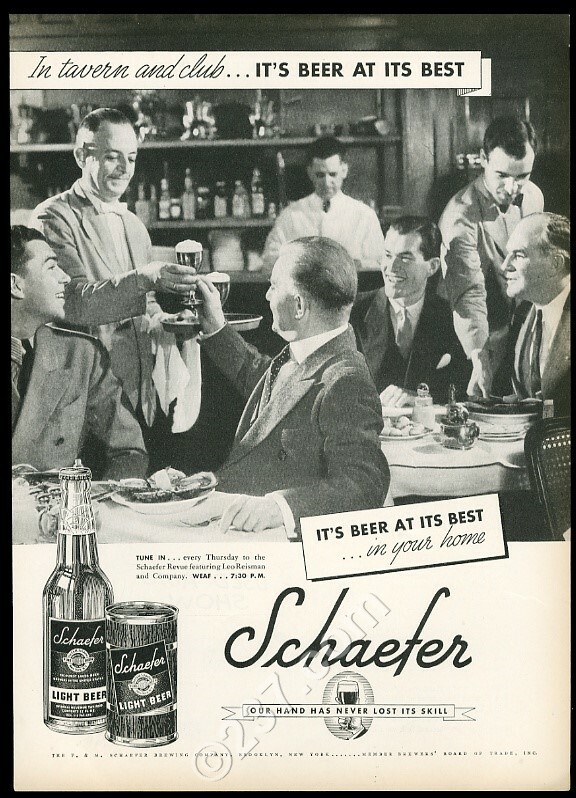 By the early 1900s, its customer base in the Northeastern United States made Schaefer the most popular beer in the country, a position it maintained until ceding it to Budweiser in the 1970s. The Schaefer brand continued to decline, and as of 1999 is owned by Pabst Brewing, a holding company that contracts for the brewing of formerly popular regional brands. 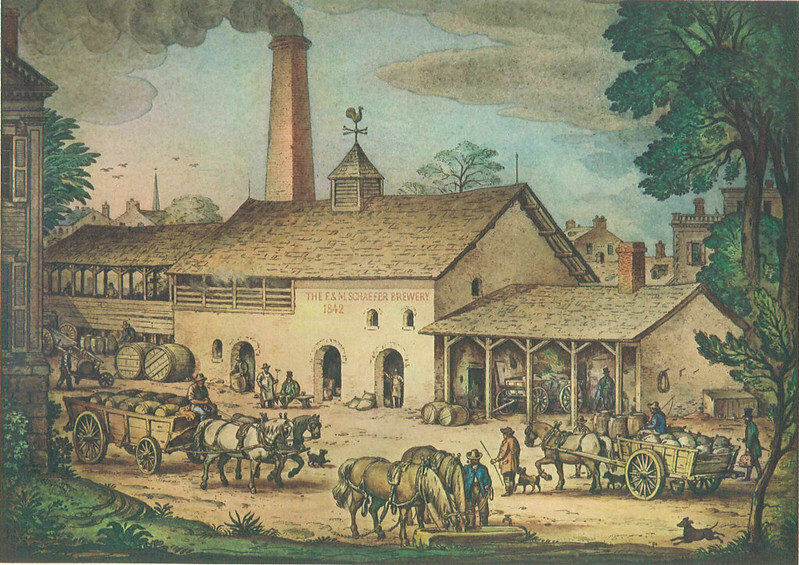 This is what the brewery looked like in 1842, when Maximilian and his brother opened the brewery. Below is part of a chapter on the history of F&M Schaefer Brewing Co., from Will Anderson’s hard-to-find Breweries in Brooklyn. 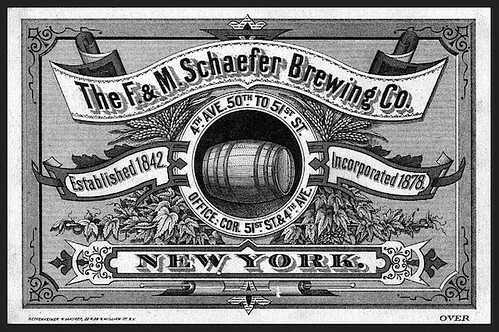 Longest operating brewery in New York City, last operating brewery in New York City [as of 1976], and America’s oldest lager beer brewing company — these honors, plus many others, all belong to The F. & M. Schaefer Brewing Co.
“F. 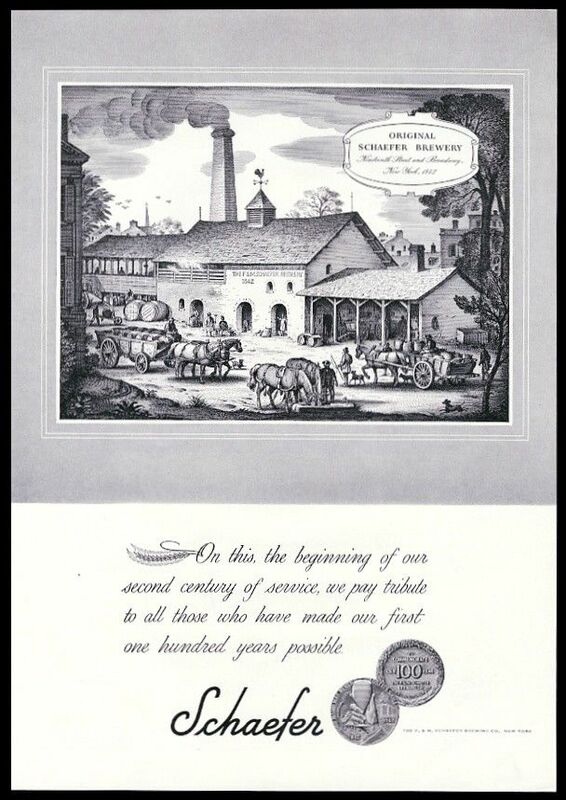 & M.”, as most breweriana buffs know, stands for Frederick and Maximilian, the brothers who founded Schaefer. Frederick Schaefer, a native of Wetzlar, Prussia, Germany, emigrated to the U.S. in 1838. When he arrived in New York City on October 23rd he was 21 years old and had exactly $1.00 to his name. There is some doubt as to whether or not he had been a practicing brewer in Germany, but there is no doubt that he was soon a practicing brewer in his adopted city. Within two weeks of his landing, Frederick took a job with Sebastian Sommers, who operated a small brewhouse on Broadway, between 18th and 19th Streets. Frederick obviously enjoyed both his job and life in America, and the next year his younger brother, Maximilian, decided to make the arduous trip across the Atlantic also. He arrived in June of 1839 and brought with him a formula for lager, a type of beer popular in Germany but unheard of in the United States. The brothers dreamed, and planned, and saved – and in the late summer of 1842 they were able to buy the small brewery from Sommers. The official, and historic, starting date was September, 1842. The new brewery they built in 1849. Sommers’ former facility was a start, but that’s all it was, as it was much too small. New York beer drinkers immediately took a liking to “the different beer” the brothers brewed, and in 1845 Frederick and Maximilian developed a new plant several blocks away, on 7th Avenue, between 16th and 17th Streets (7th Avenue and 17th Street is today, of course, well known as the home of Barney’s, the giant men’s clothing store). This, too, proved to be just a temporary move; the plant was almost immediately inadequate to meet demands and the brothers wisely decided to build yet another new plant, and to locate it in an area where they could expand as needed. Their search took them to what were then the “wilds” of uptown Manhattan. In 1849 the brewery, lock, stock and many barrels, was moved to Fourth Ave. (now Park Avenue) and 51st Street. Here, just north of Grand Central Station, the Schaefers brewed for the next 67 years, ever-expanding their plant. The only problem was that the brothers were not the only ones to locate “uptown.” The area in the 40’s, 50’s and 60’s grew rapidly all during the last half of the 19th century, and especially after the opening of the original Grand Central Terminal in 1871. 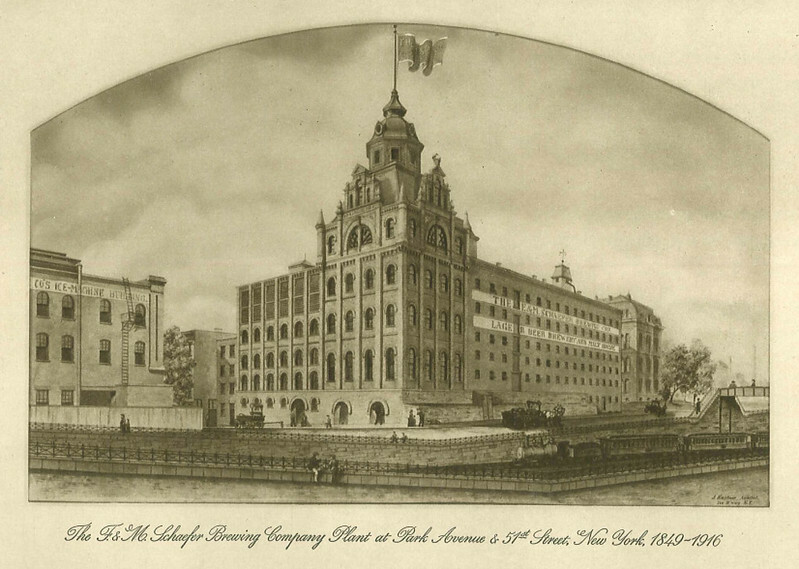 Frederick and Maximilian had wisely purchased numerous lots between 50th and 52nd Streets, and by the time they passed away (Frederick in 1897 and Maximilian in 1904) the brewery was, literally, sitting atop a small fortune. 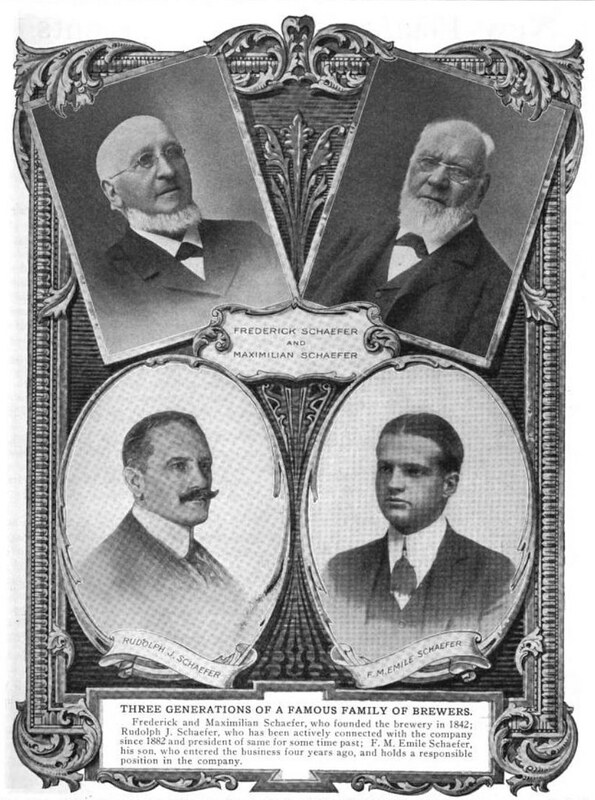 Maximilian’s son, Rudolph J. Schaefer, fully realized this when he assumed the Presidency of the brewery in 1912. In that same year Rudolph purchased the 50% of the company owned by his uncle Frederick’s heirs. He thus had complete control of the brewery, and one of the first matters he turned to was the suitable location for a new, and presumably everlasting, plant. In 1914, in anticipation of its move, Schaefer sold part of the Park Ave. site to St. Bartholomew’s Church. This sale, for a reputed $1,500,000, forced Rudolph to intensify his search for a new location. Finally, in June of 1915, it was announced that the brewery had decided on a large tract in Brooklyn, directly on the East River and bounded by Kent Avenue and South 9th and 10th Streets. Here, starting in 1915, Rudolph constructed the very best in pre-Prohibition breweries. The move across the river to their ultra-new and modern plant was made in 1916, just four years before the Volstead Act crimped the sails (and sales!) of all United States breweries, new or old alike. 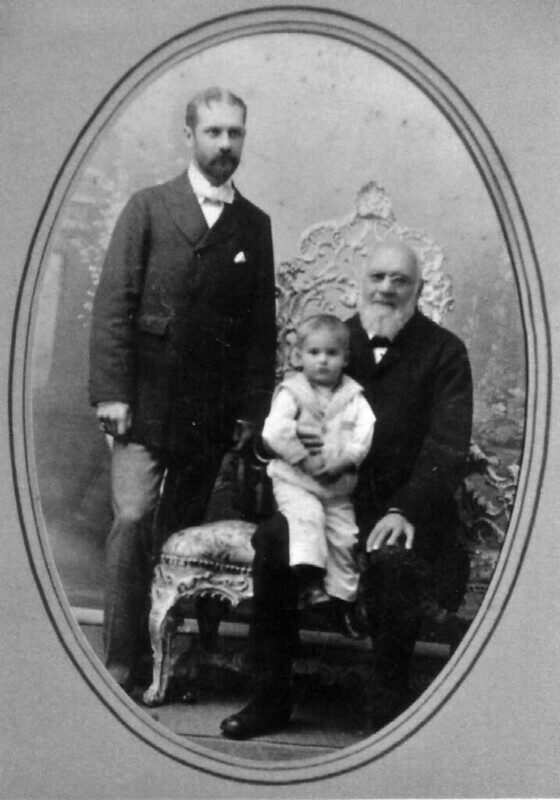 The Schaefers around 1895, with Maximilian Schaefer sitting down, his son Rudolph Schaefer standing behind him, Maximilian holding F.M. Emile Schaefer, his grandson and Rudolph’s son on his lap. 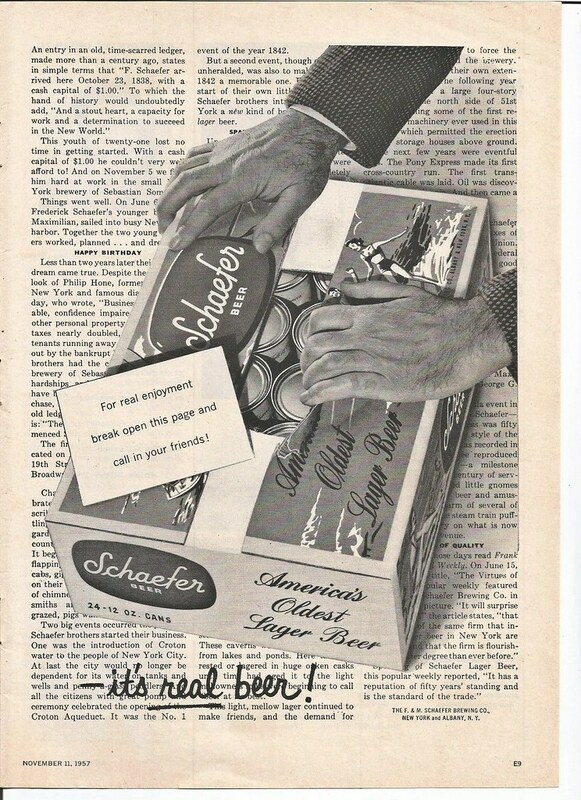 Sunday’s ad is for Schaefer Beer, “first produced in New York City during 1842 by the F. & M. Schaefer Brewing Company.” This ad, from 1957, features a background that is designed to look like just another page in the newspaper, but with a case of Schaefer beer, and a pair of hands trying to open the case and get to the cans of beer. I guess the idea was that you’d turn the page and it would look so real you’d try to grab a beer off the page. 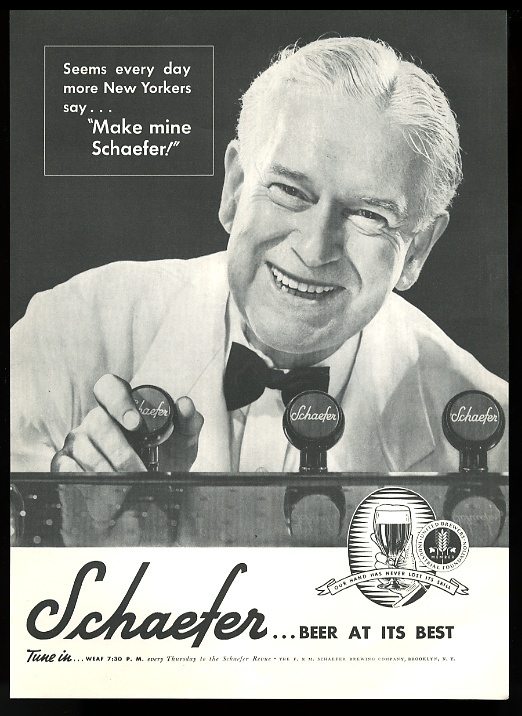 Saturday’s ad is for Schaefer Beer, “first produced in New York City during 1842 by the F. & M. Schaefer Brewing Company.” This ad, from 1939, features an older, smiling “Coach-type” of bartender filling a glass of beer from a tap. It’s a shame that bartenders no longer routinely wear bow-ties. I guess John Holl missed his calling. 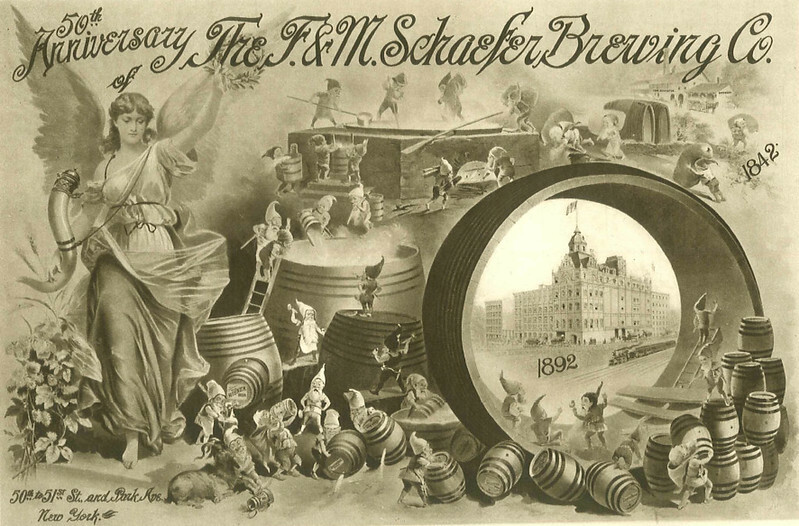 Friday’s ad is for Schaefer Beer, “first produced in New York City during 1842 by the F. & M. Schaefer Brewing Company.” This ad, from 1942, features an illustration of their first brewery in 1842 to celebrate their 100th anniversary. Beer In Ads #2776: You Can’t Beat It! 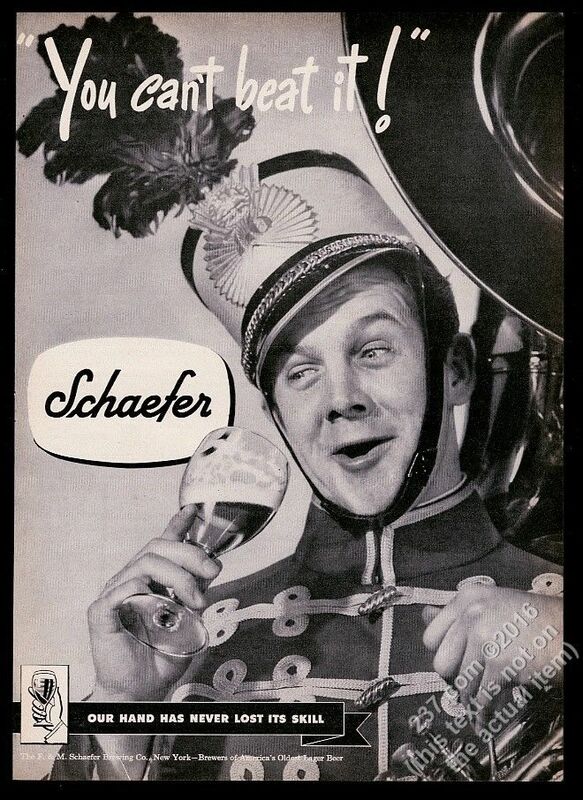 Thursday’s ad is for Schaefer Beer, “first produced in New York City during 1842 by the F. & M. Schaefer Brewing Company.” This ad, from 1946, features a Sousaphone player wearing a band uniform and drinking a beer. “You Can’t Beat It!” he seems to be saying, but I’m not sure if he’s talking about playing in a band or drinking a beer while playing in a band. This takes me back to my high school days when over the summers, I played in a semi-pro marching band where we were paid to march in fireman’s parades, and afterwards there was usually kegs of beer for us. 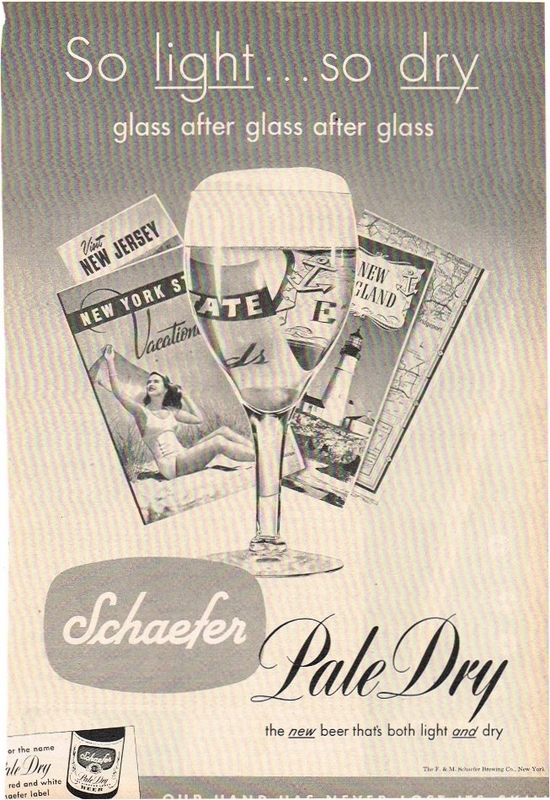 Wednesday’s ad is for Schaefer Beer, “first produced in New York City during 1842 by the F. & M. Schaefer Brewing Company.” This ad, from 1950, features Schaefer’s then-new beer Pale Dry, “So light … so dry glass after glass after glass.” Behind the glass of beer are several roadmaps (so kids, before there was Google Maps or GPS people used roadmaps to drive from one place to another) for vacation destinations like New Jersey, New York State, or New England. I guess the idea is that Pale Dry is so pale you can read a map through it? Beer In Ads #2774: Line’s Busy! 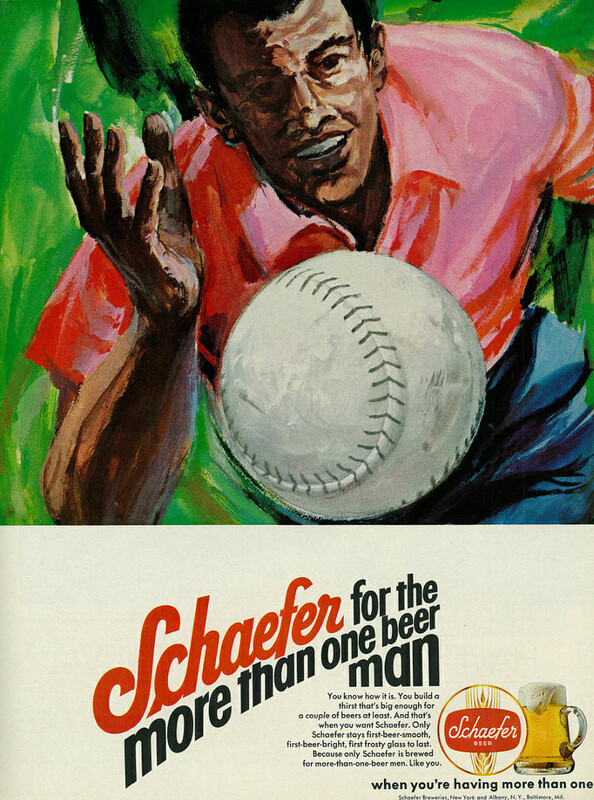 Monday’s ad is for Schaefer Beer, “first produced in New York City during 1842 by the F. & M. Schaefer Brewing Company.” This ad, from 1971, features a close-up illustration of a man pitching a softball. Since the playoffs for MLB are around the corner, this might get you in the mood. 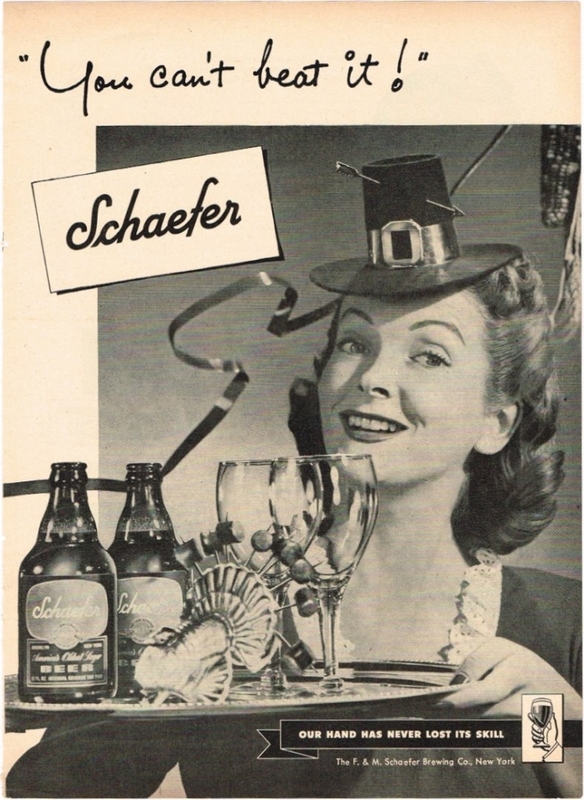 Sunday’s ad is for Schaefer Beer, “first produced in New York City during 1842 by the F. & M. Schaefer Brewing Company.” This ad, from 1947, features a very enthusiastic Thanksgiving dinner. I say that because I’ve never even heard of a Thanksgiving dinner where people dress up as pilgrims with little pilgrim hats. She’s also carrying a tray of beer that also has on it a turkey centerpiece with toothpicks holding cut-up hot dog pieces. Yum. Of course, maybe they’re turkey dogs?